One evening last week, while I was enjoying creating the energies in my new apartment, the faeries started to get all excited. They told me that one way to increase my energy, was to increase the vibrational energy in my space. Ever since I was a child, I always liked to do things like burn candles or incense. I always felt that doing things made my living environment feel better. When I was in my late teens I learned about sage and sweet grass, and I was smudge my space often. I continue to do so to this day. I find it really helps me to clear off some negative energy, or to make me feel grounded and centered. Lavender, sage, mugwort, copal resin, amber, myrrh and frankincense. The faeries really love the number 7, so they were super happy with number of ingredients as well as the combination. I took each ingredient, and separately, I ground them up and put them in a bowl, and then at the end I took them all and ground them up together to mix them all well. I took my copper bowl that I use for burning small things, I took a small piece of coal and got it burning and then I added a pinch of the mixture. As it was smoking, I took it around my house and smudged each room by going to each corner of the room. I did this about 7 times, just for good measure. I really felt the intensity of this mix! I find it really does raise the vibrational level of my space. I had some friends over a few days later and tried it on them, and they said the felt good after I burned it. I really like the feeling of an energetically raised room, and I feel really good in it. The only caution I would put is that I found I wasn’t very tired when I went to sleep in my room, and I woke up really early. I felt rested though, so it’s not really a bad thing. Other ingredients the faeries said are good to use if you are going to make yourself a super smudge mix are: Cinnamon, vanilla bean, cedar, dries rose petals, cloves, nutmeg, anise, juniper berries – the faeries really love these smells, so this will also attract more of them into your space. Really, though, you can add anything you think will make you feel good. Try your own combinations and see works best for you. The faeries say it doesn’t really matter what number of items you put in your mix or what you put in your mix, they think the process is just fun and if you have fun making it it’s probably going to make you feel good and increase the energy of your space. Have a happy fun smudge time! wow, so simple! 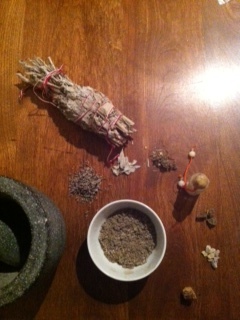 i forgot i have sage at home…;) and to add other ingredients? good idea! I like to try to keep things simple these days, haha.